sweep up or down through hundreds or                    want to do broad range converging sweeps. this is you can run through many frequen-               10 to 100% duty cycle capability. 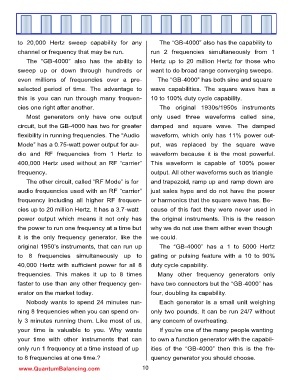 dio and RF frequencies from 1 Hertz to                  waveform because it is the most powerful. it is the only frequency generator, like the            we could. 40,000 Hertz with sufficient power for all 8            duty cycle capability. erator on the market today. four, doubling its capability. ly 3 minutes running them. Like most of us,             any concern of overheating. to 8 frequencies at one time.? quency generator you should choose.